Split spoke wagon wheel. 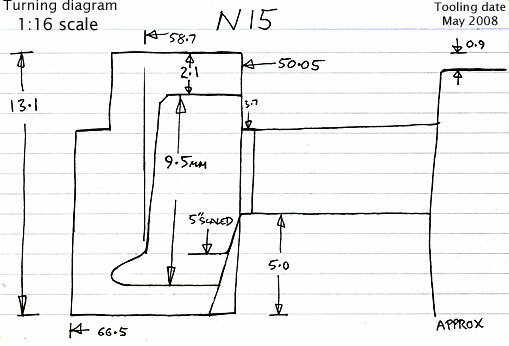 Railway Clearing House dimensions for 8 and 10 ton wagons. 3′ 1″ diam., 8 split spokes, rectangular inner rim, 2½″ apparent tread. 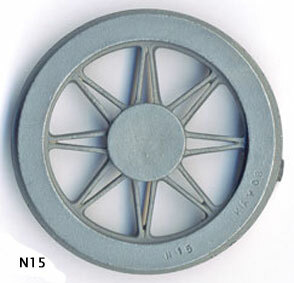 Hub 13″ diam, 1″ out from the tyre. Source: L. Tavender, Coal Trade Wagons page 9. Casting: 58.7 mm tread dia., 50.05 i/d., hub 1.2 mm out from the tyre. Suitable for scale or for 10.3 mm tyre widths.